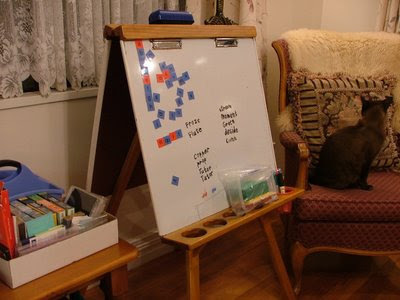 A Visual of How we Organise our Homeschool day. Daisy & Bobbi's working folders holding (mostly) just the days work. The Workbox system looks great. All those containers loaded and ready to go. Here , Here or, Here are a few good places to start browsing for those interested to see more. Also for younger HS children maybe Here . I'd love to have a go, but ... knowing me I'd end up tiring of it really quickly (blush) so we'll have to just continue our way, with modifications, thanks to the Sonlight moms who shared on the Sonlight Forums the way they are implimenting workboxes. They've given me some great ideas to help make our day go more smoothly by realigning our folders to work almost like a workbox style system, just without the boxes. 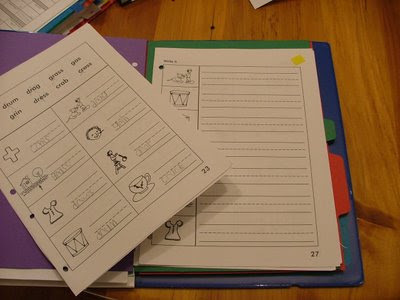 We find working this way - with a really organised folder - along with our general daily schedule is helping the children to move ahead more smoothly to the next lesson and the children can see how much they have achieved and what is still left & I've taken to setting the folders up for the next day as soon as we have finished learning for that day. The first picture is my working folder with 1 days work in Homeschool Tracker+ schedule, on the left, and Sonlight's Core 2 schedule for the week on the right. 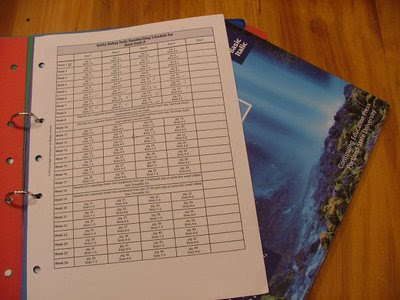 The high lighting colour coding on Homeschool Tracker's schedule; Green - Bobbi's work, Blue - Daisy's, Yellow - our to do together extra's, Pink - Memorisation songs or pieces. 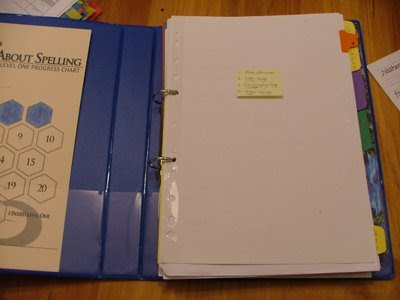 The sticky tabs mark places I may need to flip to quickly (next Read Aloud, History, or, each childs next page of Reader notes). 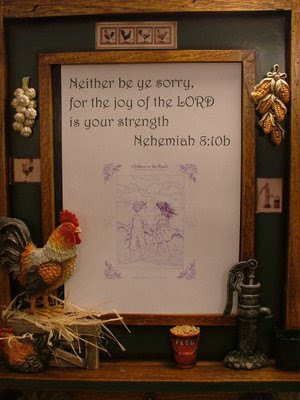 This is our visual space for me to print out the weeks scripture memory verse we've typed up using Startwrite. This little notice board is right near our dining room table so works perfectly. 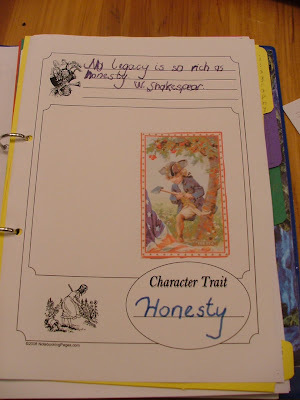 The children's copywork sheet, which is placed in their work folders and mum's book, A Gift of Values, which lives in my handy purple trolley (picture further down the page) I'll pick Daisy's folder, above, to show how we set up our work. The yellow sticky note details what we need to do together before we open the folder further. 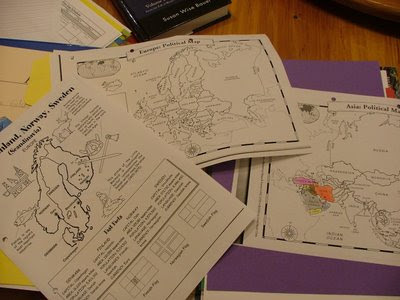 Geography pages to colour and mark, or can be anything we've choosen to do with each country. 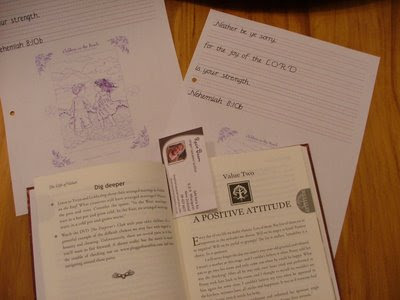 The Story of the World ( SOTW2 ) text and related activity guide are kept in my purple trolley. 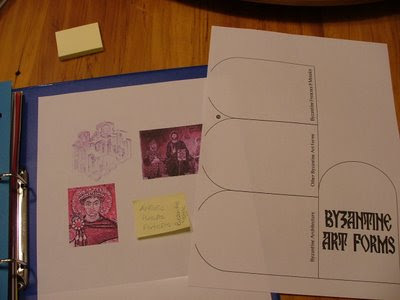 All the history activity pages for the week go in here and we pick and choose what we'd like to do. Daisy's handwriting schedule to refer to & the Italics book tucked in behind. 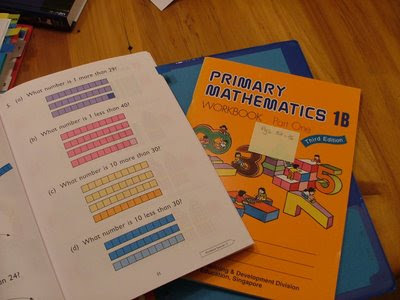 Once she has finished the book/ worksheets the completed works is placed on the bench for Mum to mark and Dad to see once he gets home. Writing With Ease teachingtext is kept in my purple trolley. 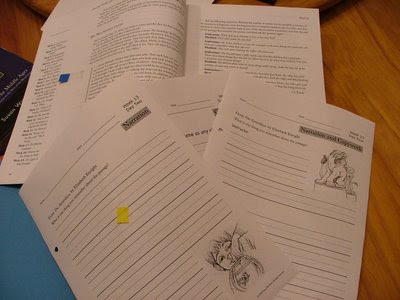 We place the whole weeks work pages in their folders, though the children know we only do the page with the sticky on and it's easy for me to see if we have a copywork overload in the language arts area with Queens L/A's work. Explode the Code - normally 4 pages worth. Daisy knows to *stop* once she get to the sheet with the yellow stick. Again all finished sheets go on the counter for marking and Dad to see. Queen's Language Arts. We decide on the day how much to do as the lessons are short and many to be done with mum. 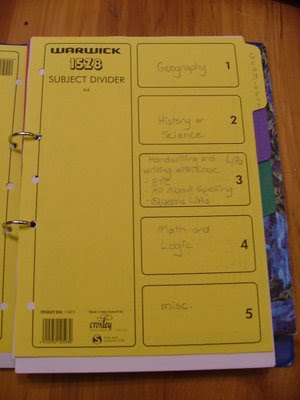 I've shown both the 'teaching text' & the work book but normally if it's teaching with mum there is just a yellow sticky on the divider card detailing that & the page for my reference. 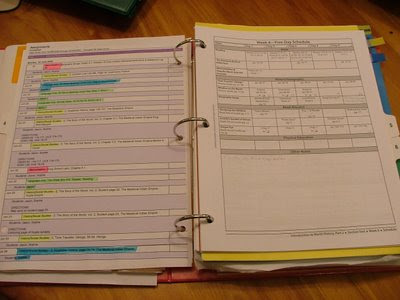 Otherwise the practice book is in there with page details or a sticky of a math game, or other, to enjoy. There's that purple trolley :-) which lives tucked in under the childrens early childhood play table when we are not in learning mode and is full of the books I , or the children, need and use most days. The cupboard has extra books and folders on it that we need occassionally. Aand the 'fancy' cardboard box (have to get something visually nicer) houses hands on extras books and crafts which are sorted into themes. All the felts, pencils, scissors etc.etc... we need to use live on that small table . They go back there every day!!! One day Dad plans to build a 'something' for there that is better suited. This works for now. 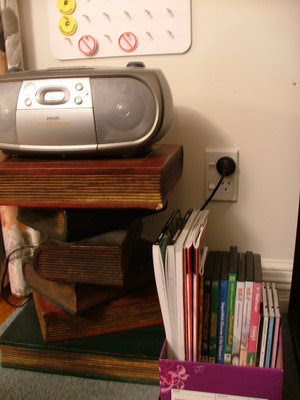 This box lives in the lounge right under the chore board and is where we listen to our memorisation pieces and the children can find the Sonlight , Singapore Math discs quickly. 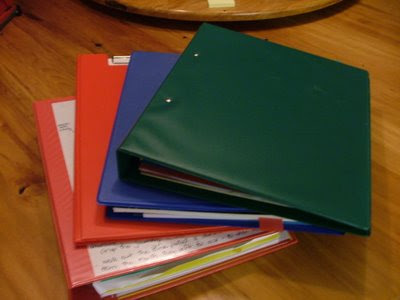 I keep catagorised slip file folders on the sideboard fill of the pages we'll need to replenish our work folders. 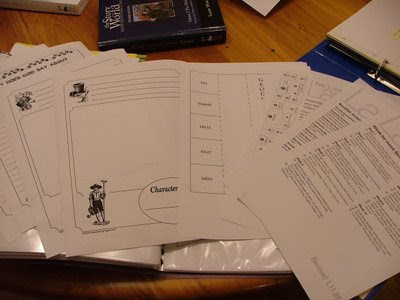 In the very back of each childs working folder, in the clear pocket, goes the other items that are either current, or soon to be, art or lapnote projects which the children can pull out to do during read alouds. This is my slim line clip folder, from the first few pictures, with all it's bit n pieces pulled out. 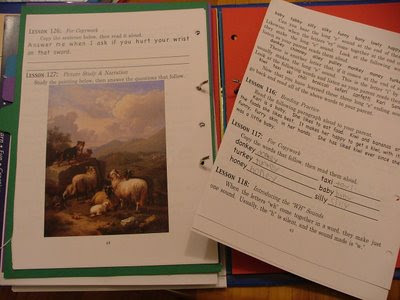 It holds the weeks 'routine' schedule and the current Read Aloud, Reader notes and relevant Sonlight copywork pages. So those are the folders we use each week, all refreshed and ready to open on Monday and they live on the 'play' table at the end of each day. ETA: If you're interested to see how what our organising journey currently looks like, just click the organising label under our Labels list on the right. It is scary to see someone with almost the same curr as our family. 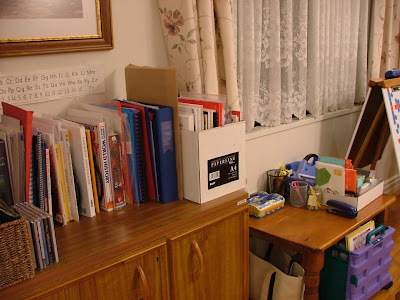 TOG, AAS, Singapore, Startwrite, Italics, lap/notebooking, we even have the not so fancy 'box' and the purple trolley. I think I need to utilize the trolley. We are starting workboxes this year in an attempt to be more organized. 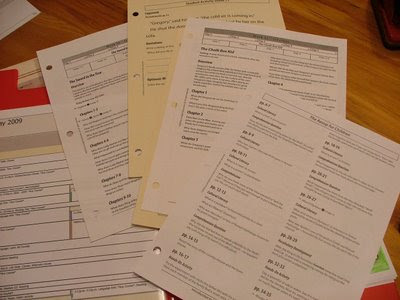 I myself hate binders though and have succumbed to the magic of proclick. & blushing just a little, the TOG bits n pieces you see here, are click on's to our main curric SL. I'd 'love' to see what you're doing!! I loved this post. 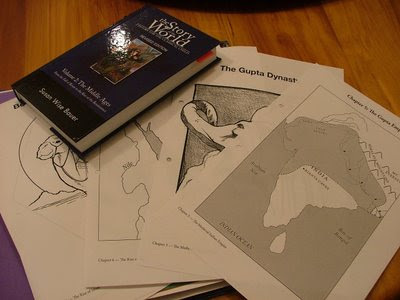 One of my summer projects is pulling things together more for the coming year so that all the good resources I have don't get lost in the shuffle. And, happy Summer sorting - it seems to make the Winter months go more smoothly.